A number of 15-inch MacBook Pro with Retina display owners are experiencing noticeable drops in graphics and processor performance after having updated their machines to the latest EFI (extensible firmware interface) version, such as drastically clipped frame rates when running graphics-intensive programs. According to separate threads on the Apple Support Communities forum, some 15-inch Retina MacBook Pro users noticed the performance drop immediately after installing Apple's MacBook Pro Retina EFI Update v1.0, which was released in September. While it is unclear if the firmware is to blame, many owners feel the update has been detrimental to how the system handles heavy workloads. The issue is most pronounced when waking a computer from sleep, playing a graphics-intensive game or operating Windows in boot camp. Under heavy load, the CPU, GPU, or both are being underclocked as core temperatures reach or exceed supposedly conservative thresholds. In the case of AppleInsider reader Filipi, his Retina MacBook Pro's GPU begins to throttle down the machine's discrete GPU to 700MHz from 850MHz, at a reported temperature of 65 to 70 degrees Celsius. 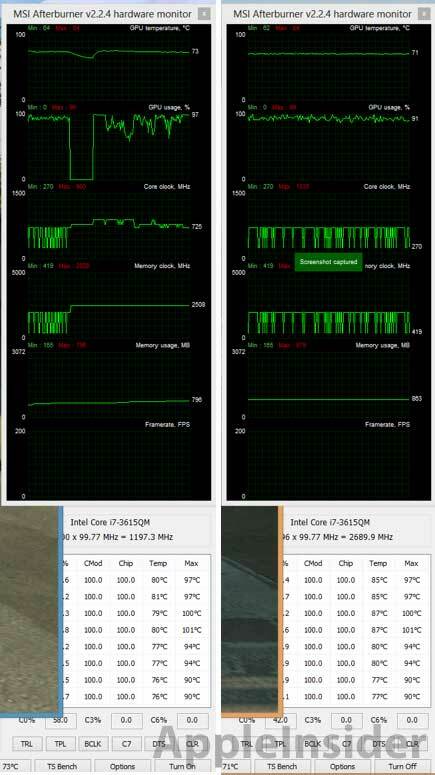 The GPU is pulled back further if the CPU temperature hits 80 degrees Celsius. From this information, it can be speculated that the computer's firmware may not be correctly communicating with the thermal sensors, the threshold presets may be conservatively low, or there is an error with systems management. Intel notes on its website that the Tjunction maximum, or highest operating temperature specification, of the processors used in the Retina MacBook Pro is 105 degrees Celsius, a much higher threshold than where forum members are seeing throttles. This could mean the problem lies in how the thermal management system handles the data from the digital thermal sensor (DTS), which is integral in calculating a processor's Tjunction. It should be noted that Intel chips, like most modern CPUs, have built-in thermal shutdown capabilities to prevent permanent damage to the silicon. According to the forum members, the Retina MacBook Pros operated without fault prior to EFI version 1.0. Some have found that resetting the SMC or flashing the PRAM solves the problem temporarily, however the fix is far from permanent and owners report a reoccurrence after the computer wakes from sleep.